LUCKNOW: Indian Prime Minister Narendra Modi out-campaigned all-comers in the 2014 general election but, as he faces his biggest mid-term test, he is up against a rival determined to beat him at his own game. 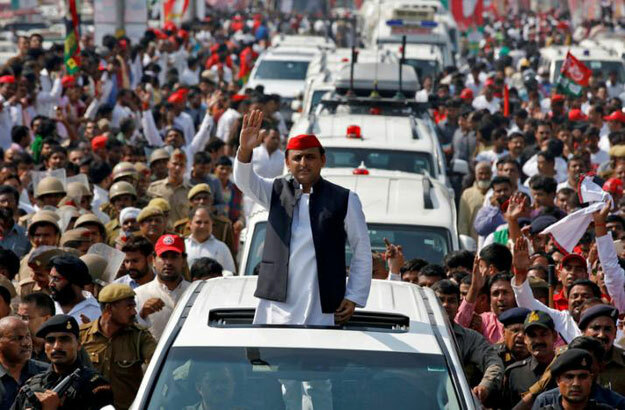 In Uttar Pradesh his opponent, Chief Minister Akhilesh Yadav, has been repackaged as a youthful and media-savvy go-getter who seeks to steal a unique selling point of Modi’s – development. Yadav entered the vast election, being held over the course of a month, as a narrow favorite: He had just emerged from a power struggle with his domineering father and struck a pre-poll alliance with the Indian National Congress . “It was at this point Yadav took a cue from Modi’s image as a technology-loving modern man,” said RK Mishra, an independent political analyst in Lucknow. “The recruitment brief was clear: Everyone working in the war room should be in their thirties and have family in Uttar Pradesh,” said Aashish Yadav, a campaign manager who previously worked at BBC Media Action, a development charity. Aashish Yadav manages a team of 100 young men and women who compose jingles as well as messages that are circulated via WhatsApp and community radio services. “Modi’s campaign looks jaded compared to our blitzkrieg,” said Aashish. It’s been a tough sell for a party that under founder Mulayam Singh Yadav, Akhilesh’s father, was criticised for breakdown of law and order. Many resented corruption that favored the Yadav community – a “backward” caste that makes up 9 percent of the population of Uttar Pradesh. “Akhilesh had to dismantle the existing perception about himself and his party,” said one close aide, who spoke on condition of anonymity. By teaming up with Rahul Gandhi of Congress – another forty-something politician – Yadav hopes to prevail in the three-cornered contest with the BJP and the Bahujan Samaj Party (BSP) led by Mayawati, a former chief minister of Uttar Pradesh. “There is a great deal of ease between the two leaders and this is making Modi nervous,” said an aide to Gandhi, who is the son, grandson and great grandson of Indian prime ministers. Pre-election polls put the Yadav-Gandhi alliance and the BJP in a close race, but no surveys are allowed during voting held over seven stages. Results are due on March 11. Gandhi and Yadav have both turned for advice to Prashant Kishor, the strategist who stage-managed Modi’s triumphant 2014 march on New Delhi. Kishor later switched sides to help a similar opposition alliance defeat the BJP in Bihar, another big northern state, in late 2015. He now divides his time between advising Congress and Samajwadi. The BJP’s state leader in Uttar Pradesh, Keshav Prasad Maurya, dismisses the alliance as a fiasco and called the war room a poor imitation.